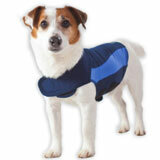 Thundershirt is an excellent treatment for most types of dog and cat anxiety and fear issues. 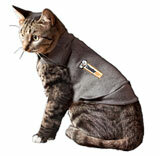 Thundershirt’s design applies gentle, constant pressure on a cat’s torso, and this pressure has an amazing calming effect for most cats. Pressure has been used to successfully reduce anxiety for many years for both animals and humans. Examples include parents swaddling infants, veterinarians using squeeze chutes when vaccinating cattle, and thousands of people with autism using pressure to relieve persistent anxiety. 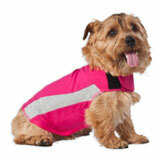 Sizes available - adjustable fasteners allow a snug fit to many different body shapes. Thundershirt's patent-pending design applies a gentle, constant pressure that has a dramatic calming effect for most dogs. 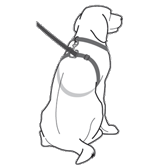 When puppies are learning proper leash behavior around new dogs and new people.